The 2013 Fred Page Cup playoffs get underway on Friday evening, and the Surrey Eagles will open up against the Langley Rivermen in the Mainland Division Semi-Final. The Birds finished in first and have home ice advantage in the best-of-five series while the Rivermen ended the season in fourth in the division, five points ahead of the last place Coquitlam Express. 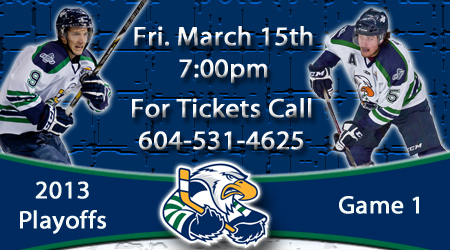 After a season series that saw Surrey take seven of eight games from Langley, including all four at the South Surrey Arena, the Eagles will be looking to get out to a strong start in the post-season on home ice. Surrey hasn't lost in regulation at the nest since December 16th thanks in large part to the play of Michael Santaguida in net. The Ontario native picked up some hardware earlier this week after winning the BCHL's Goaltending Award by posting a league-best 2.28 goals-against average in the regular season. Devon Toews was also honoured as the Coastal Conference's Top Defenceman. The Rivermen were also represented when the league awards were handed out as forward Mario Puskarich took home the Brett Hull Trophy as the top scorer after amassing an impressive 89 points (41 goals, 48 assists). Hailing from Fort Walton Beach, Florida, Puskarich is one part of a dangerous top line for Langley that also consists of Evan Campbell and James Robinson. The trio combined for 23 points against the Birds during the regular season. The Rivermen are entering their first playoff series since the team was renamed in 2011. If you're attending the game, make sure to bring your radio and listen to the play-by-play in the arena on 88.7FM. When: Be there at 7:00pm. How to listen: Eagles Broadcast or on 88.7FM in the arena.